My twitter explorations lead to finding this today. So there’s a positive. I guess that I was searching for ‘motivations to engage with the digital environment’ in my musings over the meaning of participation whilst also wondering if I am too old to get to grips with this. I was inspired by Diana Laurillard response to a big question in the webinar yesterday about ‘reluctant’ staff – aren’t we all unskilled / time-short and lacking in confidence? This also linked with a later discussion on whether as teachers we could do this for ourselves – if we don’t it will be some bright spark from Computer Engineering that gives us what they think we need. That’s a rallying call to get involved or get lumbered! Love carrot and stick – works for me every time. 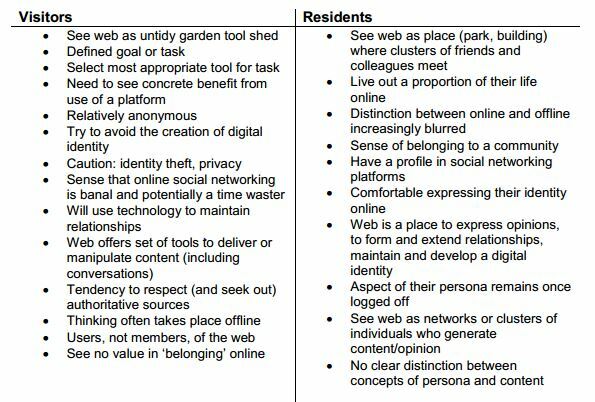 So from the work below I can see that I tick quite a lot of the visitor boxes – seeking out authoritative sources, thinking taking place offline – users not members…back to participation. But can definitely see some potential in the other side. Off to muse offline, obviously.